If you just found us, start here to get the information you need about St. John's Lutheran Church. Join us on Sunday morning for our 8:00 a.m. or 10:00 a.m. worship services. We look forward to meeting you. One of the best ways to grow your faith is to get involved. Each week many folks volunteer at St. John’s in a variety of ways. The Child Day Schools staff and families would like to thank St. John’s Lutheran church. 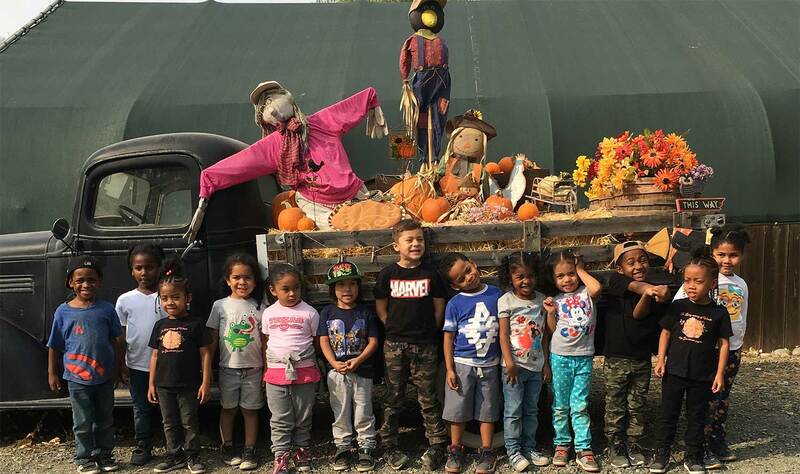 Because of your generosity and kindness, the preschool classrooms were able to enjoy an amazing and fun-filled day of music, games and hay rides! The children also got to choose a pumpkin to bring home! This field trip to Smith Family Farms would not have been possible without your generous support! We also want to thank Audra Goldstein. When she found out the pumpkin patch field trip would not be possible this year, she suggested her church may be able to help defray the costs. She made that happen and it is very much appreciated! *pictures posted with permission from The Child Day Schools. Our mission is to lead all generations into a deep and transforming relationship with Jesus Christ - praying and supporting others in their own walk of faith so that they can live a life where they thrive and flourish. Wherever you are on your faith journey, we welcome you to our spiritual home where all are welcome and encouraged to join as we grow in faith. Jesus Christ is the center of our faith and life together, we trust in His love to change us as we come to know the true depth of His grace. We believe the Church operates as an extended family – where we seek to care for one another in authentic, joy-filled and life-giving relationships. We are dedicated to putting our faith into action by striving to make a caring and understanding difference in the lives of our neighbors and the world in practical, realistic ways. Each week, we meet to encourage support and pray for one another while slowly and thoroughly studying a selected book of the Bible, both the Old and New Testaments. All questions are welcome! We have studied books from the Old and New Testaments. View More Events and Announcements!